How Does Social SEO Affect In-Store Shopping? With great social power comes greater in-store success. Social SEO - which combines optimized data with niche digital channels, targeting key demographics through automated postings - reigns supreme. The endless wave of shares and tweets builds every brand’s presence, and real-time metrics help to analyze (and adapt) content as needed. An unexpected value of this process, however, is its impact on in-store purchasing. Those with established social brands will find themselves experiencing a rise in profits, traffic and local success. 45% of North American consumers believe that online content makes in-store shopping easier. 29% of North American consumers are more likely to make same-day in-store purchases after visiting a brand’s media channels. 67% of North American consumers read online product reviews before making in-store purchases. 33% of North American consumers spend more in-store after visiting a brand’s media channels. These statistics prove the power of social SEO, with consumers engaged both online and in the real world. Through a strong media presence, companies can better connect with their audiences: offering a steady stream of promotional content, reviews, inventory listings and more. This translates to higher in-store ratios and improved sales. To learn more about social SEO contact Webstager. We’ll be happy to create a custom strategy for your brand. Virtual marketing was once an uncertain process. Content creators stepped slowly from their print ads, nudging text toward gateway pages and then-unproven blogs. Resistance was high but results were undeniable, and SEO strategies eventually reigned supreme. Throughout the years these strategies have evolved - branching into micro-sites, video channels, niche directory posts and more. The most popular method, however, is social SEO. This process (which combines network automation with localized tags) provides direct connections between companies and consumers, and it’s become an essential element of long-term branding. 93% of SEO marketers use social media. 70% of SEO marketers use Facebook to gain new customers. 70% of SEO marketers use Google Plus to gain new customers. 34% of SEO marketers use Twitter in their lead generation strategies. Facebook, Twitter and Google Plus are the most popular networks used by SEO marketers. Flickr, Tumblr and StumbleUpon are the least popular networks used by SEO marketers. Networks shapes SEO and Webstager knows they will continue to inspire SERPs, sales and social authorities in the future. To learn more about social SEO contact us today! You’ve just finished a SEO masterpiece - a blog stuffed with compelling content, localized keywords and a series of tag-infused images. It’s certain to impress your many followers and inspire endless network shares. This will be your social triumph. It’s instead a social failure, with few clicks and fewer comments. You’re frustrated; you’re confused; you’re... posting on the wrong day. Sunday: 11.84% of total traffic. Monday: 14.47% of total traffic. Tuesday: 15.04% of total traffic. Wednesday: 15.59% of total traffic. Thursday: 15.77% of total traffic. Friday: 14.53% of total traffic. Saturday: 12.75% of total traffic. 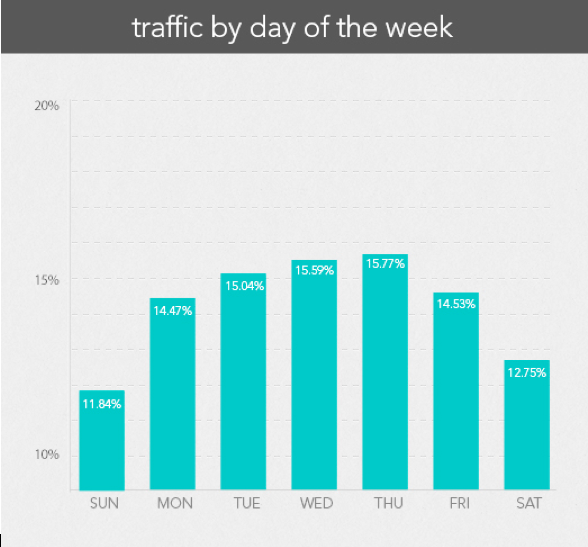 Through these percentages content creators can clearly see a click-through pattern, with most traffic centered around the mid-week. Conversion numbers, conversely, plummet on Saturday and Sunday. It’s important for writers, editors and other SEO strategist to study this information and apply it to their posts. Want to know more about SEO traffic patterns? Contact Webstager today! Optimized content is written content. This is the assumption shared by many marketing companies. Information is to be - neatly, concisely - presented through blogs and gateway pages. Text ensures SEO success. This isn’t false. It’s merely not entirely true. SEO marketing has changed within the last decade. With the introduction of social networks, niche directories and third-party apps content has shifted toward a multi-media design - and those rooted in traditional formats are falling behind in both SERPs and sales. It’s essential, therefore, to embrace all forms of SEO: especially YouTube videos. More than 6 billion hours of footage are watched each month on YouTube. 64% of users say that watching videos makes them more willing to purchase a product. 75% of users say that videos increase their understandings of products and services. 81% of the users on YouTube are in the crucial 14-to-18 demographic. These statistics prove the value of YouTube. The site allows marketers to effortlessly create, post and manage their content - all while connecting to the world’s second largest internal search engine. Blogging is simply not enough. To learn more about incorporating YouTube videos into your SEO strategy contact Webstager today! Which Social Networks Prove Best For SEO Marketing? In 1973 the Community Memory was launched. This mainframe network - which was synced to multiple servers throughout the San Francisco Bay Area - utilized a rudimentary series of tags, keywords and classifications to create online conversations. It was the first public forum dedicated purely to communication. It was also the start of social SEO. Social SEO - which is the process of optimizing content for networks - has become a cornerstone of media marketing. Writers and editors alike devote their days to Facebook, Twitter, YouTube and other key directories: all in hopes of attracting local audiences. YouTube: 3:49 average daily use. Facebook: 3:16 average daily use. Twitter: 2:54 average daily use. Pinterest: 2:18 average daily use. Facebook (Mobile): 2:04 average daily use. Building a strong social presence on YouTube and Facebook proves crucial for modern marketing. These networks reign supreme, impacting consumer content and driving traffic. Use them to succeed. Want to know more about social SEO? Contact Webstager today! In 1999 Japanese mobile operator NTT DoCoMo introduced the world to online searches, fusing their signature flip-phone with TCP/IP capabilities. This service - which utilized Wireless Markup Language and DLP protocols - connected users to the web and launched the first responsive platform. It also created the need for mobile SEO... and that need continues to grow even now. Mobile SEO is on the rise and will continue to increase its cultural, economical and technological presence for many years to come. Keeing pace with smartphone demands, therefore, is essential. Content creators must embrace fluid navigation and web-friendly strategies. Need help with this? Contact Webstager! We’ll provide responsive formatting options to keep your site at the forefront of all mobile searches. In 1998 Google introduced the world to organic rankings, delivering targeted results to every query, question and keyword string. It redefined data indexing and seamlessly connected users to the information they craved. It was an undeniable success. And now it’s an undeniable force in SEO. Want to conquer optimization? Google remains the leading engine for SEO results, connecting writers, editors and coders to organic strategies and responsive algorithms. Google reigns supreme among search engines. It also strengthens SEO, rewarding organic techniques with top SERPs, higher leads and enhanced conversions - and what’s better than that? To learn more about the relationship between Google and SEO contact us today! Paid searches reign supreme: this is the promise offered by endless PPC companies, all donning their black hats as they stuff the engines with ads and hyperlinks. Rankings can be secured, they swear, through cost-per-click strategies. Make a bid for first place! This idea sounds so appealing. We’re afraid, however, that it’s little more than words on a page - because it’s 2015 and bids no longer suffice. 70% of the links users click on are organic, not paid. 60% of all organic clicks are made in the Top 3 SERPs. Companies that utilize organic SEO have 97% more inbound links than those who rely on PPC. This - when compared to the 70% of users who actively ignore paid search ads - proves the necessity of organic techniques. Webstager embraces those techniques. We understand that SEO is meant to naturally lead content through the indexes, which is why we rely on: real-time marketing, responsive design and intuitive platforms. To learn more about our organic strategies contact us today!